The following article has been copied in its entirety from http://www.delafe.com/cardenas/trinitae.htm - The impression that the Trinitarian fathers left on the author is clear. We have a debt of gratitude to Mssr. E.J. de la Fé for the translation and to Mssr. José A. Maruri for the informative and detailed account. If not for his account, this history might have been lost forever. Cuba's communist regime exiled the Trinitarian Order in 1961 and nationalized the school and its assets, but they clearly could not erase the deep impression left on the people they served. Glory to the Trinity. Forever! Prior to leaving for Colombia in 1895, Father Carlos de Jesus y María, had taken some initial steps toward establishing a Trinitarian residence in Cárdenas, an important industrial city with a busy port. The city was located in Matanzas Province, on the north side of the island of Cuba, and exuded a natural beauty that lived up to its reputation as the "Pearl of the North." In early 1898, Father Eustaquio was transferred to the city's hospital. (Seen in the accompanying early photo). Here he met a Christian gentleman, a lawyer and notary named Dr. Carlos Alberto Smith, who together with his wife, Sra. Susana Barrinat, offered the recent arrival valuable, unselfish and disinterested assistance. Thanks to this couple, and the support of many other people, the city's first Trinitarian religious community was established in a house on the corner of Coronel Verdugo and Linea, and on March 20th, 1898, holy Mass was celebrated in the Parrish Church to commemorate the occasion. The first Pastor was Father Ramon de los Desamparados, and God only knows how much work he put forth and how many setbacks he endured in the process of consolidating the small religious Community, reaching his goals, and securing the generosity and goodwill of the Cubans. But he was a very likeable and self-assured man, and with the help of his brother-priests and the support of various families, he overcame the problems that plagued him and was able to open, not only a modest classroom, but also a church on one of the most important streets in Cárdenas. Santa Isabel Hospital in Cárdenas, Cuba where Trinitarian fathers had a chaplaincy. Almost a year after the establishment of the community, and with the end of the Cuban War of Independence, the Trinitarians were released from their hospital duties and were now able to start thinking about establishing a real school, a necessity among a population that was always interested in enriching its cultural environment. As a first step, they opened a night school in a house on Laborde street, which, although larger than the one they'd had until then, was not able to accomodate a very large student body, and thus was used for only one school year. 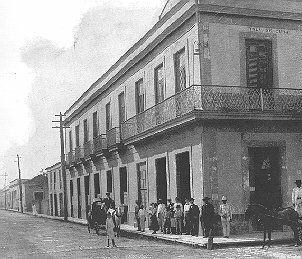 At the beginning of January, 1900, the new elementary school, named "Holy Trinity" or Santisima Trinidad, was established on Calle Real, now Avenida de Céspedes, the main street in the city. The Order was awaiting construction of its permanent building. All previous locations had been rented, but this one would be their own. Construction didn't take long, because in October of that year the new rectory and school were inaugurated on the corner of Laborde Avenue and Calzada de O'Donnell Street. The student body in the interior courtyard of the school, circa 1937. In December of 1900, the new buildings were blessed by the Bishop of Havana and Cardinal, Monsignor Donato Sbarreti, while the ceremonies were "godparented" by the Mayor of Cárdenas, General Carlos M. de Rojas and his wife, Raquel M. Andux. The Monastery and Rural Parishes. Six years later, and as a result of the generous, enthusiastic and loving contributions of the people of Cárdenas, the church was built, largely in response to the need for more space than could be allocated for religious services in the original school building. On that occasion, it was Monsignor Pedro Gonzalez Estrada, Bishop of Havana, who presided over the inaugural celebrations. It was a very special and happy occasion for him and all attendees. Prior to his promotion to the episcopate, the Bishop had been the Pastor of the Cárdenas parish, had many fond memories of the city, and had remained very interested in everything that concerned it. On this occasion, Don José Arechabala and Doña Carmen Hurtado de Mendoza García had the honor of serving as godparents of the ceremonies. In 1911, the scarcity of clerics needed to attend to the necessities of the rural parishes of his diocese prompted the Bishop to ask the Trinitarians if they would take charge over the parishes of Carlos Rojas (Cimarrones) and Mendez Capote (Lagunillas), a task that they accepted and carried out during the rest of the time that the Order remained in Cuba. In the 1930's, while Father José Aguirre was Director, lay teachers started to make their appearance at the school. Their number increased consistently during the times that followed and their dedication made it possible for the school to accommodate an increasing enrollment. The larger student population caused the then Director of the school, Father Juan Fernández, known affectionately as Father Juanillo, to appeal once more to the cooperation of the citizens of Cardenas to help widen the educational horizons of the school, by adding high school and commercial education programs to the curriculum. that would eventually become the Trinitarian School. With that goal in mind, the building next door, which had previously housed the hotel "Isla de Cuba", was purchased. Only the exterior walls remained after demolition. It was completely rebuilt for its new educational purpose and was partially inaugurated in December 1946, with the benediction of Monsignor Alberto Martín Villaverde, Bishop of Matanzas, and the First Lady of the Republic, Sra. Paulina Alsina, Vda. de Grau, serving as Godmother. The First Lady had used whatever influence she could muster in Havana to gain the government's financial support for the project. After construction was finished, an inaugural mass was celebrated in March of the following year by Cardinal Arteaga, Archbishop of Havana, who had been an enthusiastic supporter of the project. All of the Catholic schools in the city attended the ceremony, and festivities held in honor of the occasion were thoroughly enjoyed by all. The school's golden anniversary coincided with the Silver Jubilee of then-Director, Father Juan Fernandez's priesthood. The occasion was used for making various improvements to the Trinitarian chapel, including the addition of a marble altar, an electronic organ and the polichromatic windows in the sacristy. Señor José F. Iturrioz and Doña Josefa Gurruchaga, who donated the altar, were the ceremonial Godparents, with the Godfather making a sizable contribution toward the purchase of the church organ. A well illustrated memoir was published in honor of the Golden Anniversary. In addition, the Sisterhood of the Rosary, presided by Señora Elvira de Rojas, wife of the Trinitarians' meritorious physician, Dr. Francisco Oti de la Fé, in celebrating the Golden Anniversary of their organization in 1956, commemorated the event by donating the marble altars for the side wings of the chapel. One other memorable gift was made in 1957 by the Larrauri brothers, at the request of Father Ricardo Arteche. The brothers generously donated a large plot of real estate just outside of the city limits for use by the Trinitarian students as recreational grounds and athletic fields. Association of the Holy Trinity, 1904. Association of the Perpetual Rosary, 1906. Association of St. Joseph of the Mountain, 1912. Association of Pages of the Holy Sacrament (boys), 1929. Venerable Third Trinitarian Order, 1929. St. John Bosco Committee, 1945. All of them faithfully and tenaciously carried out the ends for which they were established, whether for religious, charitable, cultural or entertainment purposes. The Trinitarians left Cuba by order of Fidel Castro's "Revolutionary" Government on June 30, 1961. Before that order was given, the Trinitarians had been arrested, just like many others across the island, on April 17th 1960, as a result of the Bay of Pigs Invasion. They remained confined in the local military barracks during that day, along with the Claretarian Priests of the Parish Church, and continued to remain under house arrest for another ten days. At the beginning of May they were forced to turn the school over to the "intervenor" designated by the government, and on June 10th they were "subtlely" advised that they should leave the country. The following day they made their way to Havana, where they awaited the opportunity to leave, along with their brother priests from the capital city. Some departed on the 23rd and the remainder are said to have left on the 30th. The heartfelt farewell that they received from a large part of the people of Cárdenas contributed much to the affection that the Trinitarians carry in their hearts for that land and its inhabitants, from whom they received so many blessings. F. Ramón de los Desamparados Montesinos, 1898-1910. F. Juan Crisóstomo del Espíritu Santo Ormaechea, 1910-16. F. Serapio de Jesus y Maria Basterrechea, 1916-22, 1926-29. F. Tomas de la Virgen Zugazaga, 1922-26. F. Juan de San Antonio Torrontegui, 1929-36, 1943-46. 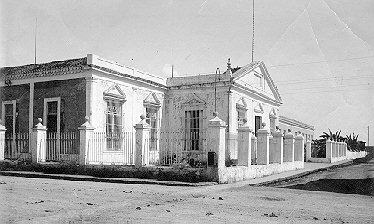 F. Serapio del B. Juan Bautista Euba, 1936-43. F. Juan de la Dolorosa Fernández, 1946-52. F. Daniel de Santiago Uberuaga, 1952-55. F. Secundino de Santa Teresa Alberti, 1955-61. Our profound appreciation goes to Mr. José Antonio Maruri for having made the above text available to us, in addition to various images that appear on this page, including the school's shield, the drawing of which he commissioned to an artist. When the school was on Calzada and Laborde, there was a large courtyard between the classroom building and the church. This grand courtyard was the place where the children would take recess. The old school building had two stories. The second floor contained the rectory where the priests lived, and the first floor was where the classrooms were located. At the rear of the courtyard was the priests' grand dining room, with a large table served by Modesto Sanjurjo, who was employed by the school for many years. From our childhood, we generally remember the simplest of things. There isn't a boy who's gone through the Trinitarian School that doesn't have nostalgic memories of the fountain in the middle of the playground, with its many fishes of multiple colors. During the entire history of the school, never was there a lack of priest that would make it his business to take care of the fountain and feed the fish. Some remember the time of Father Serapio. Others remember that of Father Secundino. I am told that recently one alumnus sent an e-mail from Sydney, Australia, reminiscing about the fountain, the fish, and the priest who used to care for them when he was in third grade. After many years, it's as though the fountain, with its fish, and its perennial guardian, represented some symbolism...an allegory. You don't have to push your imagination very far to see represented in these figures the education, the care and love received from the school by each of us who had the privilege of passing through its halls. The present condition of the entrance to the formerly beautiful chapel of the Trinitarian Priests School. Photo taken by Victor L. Maruri, 1996.